It’s a new year and with that comes new goals and aspirations for the year ahead. 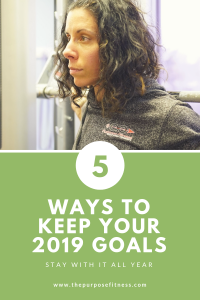 Many of us will start out with good intentions of how this year we are going to keep our goals and stay motivated enough to keep going long after the resolution glow has warn off. 80 % of people tend to fail at their resolutions by February. Don’t be discouraged, there are ways to help keep you going and make your goal a life changer. Try to think about this for a bit before moving on. Make sure your goal is something that fits into your life as it is right now. In order to keep your goals, you want to make it something that fits your lifestyle so it can become part of your existing life. Start with a goal that is measurable for a specific amount of time. Breaking up your goals into smaller time lines will make it easier to stay the course and make it a lifestyle and not just a temporary fix. Choose one goal at a time and make sure it is something that fits into your current timeline. If you are choosing a measurable goal for the next 6 weeks, make sure it is something that you can in fact attain in that 6 week time period. Goals too big in a shorter amount of time can lead to discouragement. Keeping your goals attainable will keep you from getting overwhelmed and throwing in the towel. Realistic goals will go hand in hand with making those same goals attainable. Being realistic with yourself from the start will make your goals feel much closer to you, rather than so far out of reach. Hard work is definitely part of all of this, but setting yourself up for disaster from the get-go and making completely unrealistic goals will not help the cause. When you think about the year as a whole, it can be a little overwhelming. You may have one huge goal that you want to reach by the end of the year. Think about the steps you need to take in achieving that big goal. If it is something like, I want to live healthier, think about the steps you need to take to make this happen. Be proactive in adding one change in your routine at a time. Changing too much too quickly can sometimes lead to burn out. In order to make this year successful, you need to remember that everything worth having will not come easy. Be prepared to put in the work. It’s okay if you stumble. Get up, dust yourself off and keep going. You got this! When you think about what it means to be, “healthy,” many things may come to mind. The first being the most obvious, eating right and taking the time to exercise. While these are certainly correct, there is so much more to living completely healthy. You need to decide what it is that will make you tick and keep you going long after you have lost the initial adrenaline rush in starting a new health journey. Let’s face it, life isn’t easy, it is going to throw a lot of roadblocks in your way with no warning, this we can not control. The one aspect of all this is how you will react to the things that occur in your life. How might this have to do with your health exactly? Well, having your mind right is necessary if you want anything else in your life to make sense. Training starts before you ever hit the gym floor. It is one thing to have a goal, it is all together different in holding true to it when life happens. Putting your mind to something and trying your best to flush out the negative, the doubt and the fear that goes on in your head is the real challenge at becoming a healthier, happier you. Purpose Fitness has become a place of clearing your mind, finding your path and feeling the support of those who venture into this journey of health. There is no finish line or million dollar pay out, but what is gained is priceless and goes with you well after you wrap up a training session. RPE or Rate of Perceived Exertion is a scale used to measure the intensity of your exercise. The RPE scale runs from 0-10, with the numbers on the scale ranging from easy to very difficult. Generally in 55 degree weather, our bodies will adapt to the environment by perspiring to cool the body down and in a less humid environment, the excess perspiration will evaporate more quickly than in the higher humidity. Our RPE in this environment when running or exercising at a moderate pace may be a 4 or 5. This can dramatically change when the temperature and humidity increase. When the weather is between 60 and 75 degrees, heart rate can increase by 2 to 4 beats per minute. In 75 to 90 degrees, heart rate increases by 10 beats per minute with humidity amplifying these effects even more. In turn, one’s RPE in 55 degrees can dramatically increase with the same type of exercise in 75 to 90 degree weather. In addition to sweating and fluid loss in the heat and humidity, blood volume will decrease, meaning less oxygen-rich blood is returned to the heart and less blood is shuttled to the muscles. As we get hotter, the greater amount of heat that is needed to dissipate will require a higher portion of the blood to go to the skin to cool us off. So before stepping outside to take that run or do a trail, consider your current RPE, always remember to hydrate and adjust your mindset to adapt to the changing environment. Stay safe and move with purpose. Starting your day with the right foods can make or break the stage for the rest of the day. Think about how you feel if you run out the door and skip breakfast or just grab a quick cup of coffee with the extras. You will probably feel the crash by 10:00 a.m. Think ahead before the morning hits and you are rushing to get everyone out the door on time. The benefits of eating breakfast have long been shown to improve your appetite for the entire day, keep blood sugar levels stable, improve your concentration and curb cravings for the rest of the day (Greaves, 2016). So, what should you do before you run out the door again and eat nothing, running on empty? -Prep your meal the night before. If you are eating oats in the morning, try making some overnight oats using a mason jar, 1/2 cup of steel cut oats, fresh fruit, and add some plain Greek yogurt (watch the sugar!) for the added protein. Put all ingredients in the jar and refrigerate over night. Enjoy in the morning. You can also hard boil some eggs the day before and have them ready to enjoy the next day. Instead of staying up late to catch another episode on Netflix, go to bed 30 minutes earlier and wake up 30 minutes earlier. You will be amazed at what an extra 30 minutes in the morning will give you. Make some eggs, they take no time to prepare and are full of essential vitamins and amino acids to get you through the morning. Add some veggies, (you can use frozen, pre-cut veggies to save time too). Take the few extra minutes to sit down and actually eat your meal. You will enjoy the meal and your body will thank you for taking the few extra minutes to digest instead of running out the door. Getting up earlier will give you this freedom. Take a good look at your schedule in the morning and see what you can eliminate so that breakfast can take a priority spot. When your alarm goes off in the morning, refrain from hitting the snooze button. Get up, get moving, be thankful for another day. Get your family ready for the day and take the time to take care of yourself by eating the right foods to give you the energy for the day ahead. What are training zones and why should I care? Well, training with a certain intensity will increase your heart rate, therefore making you burn more calories and get a better workout. The notorious fat burning zone or 60-75% of your maximum heart rate. Your maximum heart rate can be determined by using the formula,( 220-your age).This zone of training will build your aerobic base and aid in recovery after a hard training session. A long cardio session on the treadmill will keep you in this zone if you are walking at a pace that is fairly comfortable. You will burn a fair amount of calories but that will stop when the workout ends. If you are just starting out with a new exercise program or jumping back into training, you want to work through the training zones accordingly. This training zone will increase your endurance and train your anaerobic threshold (the point in exercise where your body can no longer sustain the exercise without oxygen). This zone will have you working in 80-85% your maximum heart rate. You will work harder, sweat more and increase your resting metabolism. For every extra pound of muscle you put on, your body will burn an extra 50 calories per day while at rest. So, although the fat burning zone is proclaimed to be the area to stay in to burn fat, think about the fact that you are burning calories while you’re sitting down after training in this zone. The longer you are at this intensity the greater your endurance becomes and the more you will burn at rest. High intensity interval training is an example of working in this training zone. This training zone will push your limits and have you breathing hard, You will work at 86-90% your maximum heart rate. This training zone will include your heavy power training and will keep your metabolism at its highest. You will want to make sure you are taking ample time to recover after training in this zone. *Always consult your physician before beginning any new exercise program. Remember to include a full warm up and cool down in all of your training sessions to aid in injury prevention and recovery. Deadlifting can be intimidating at first, but the benefits surely outweigh the intimidation. First, before beginning any exercise program, make sure you are cleared by your doctor. Once you get the go ahead to start training, get direction from an exercise professional who can instruct you with proper form and control for this exercise. The many muscle groups involved in this movement make it one of the best functional movements you can do to improve your strength, posture, and muscular endurance. Not only will doing a deadlift improve your strength, but the mental toughness needed to pick up heavy things from the ground will give you that boost of confidence that will spill into other parts of your life. A routine that involves challenging movements will push you further than you are comfortable, and in doing so, new-found confidence can be discovered. A compound movement such as this, incorporating the large muscles of your back (latissimus dorsi, trapezius muscles, erector spinae, iliocostalis, quadratus lumborum, just to name a few), the glute muscles (the strongest in the body being the gluteus maximus), the hamstrings, the muscles of your shoulders, and abdominals only cover the minimum of muscles worked in this extremely powerful movement. The perk to working so many muscles at one time goes far beyond feeling good and will kick up your metabolism to make you a fat-burning machine, making your body burn even more calories for up to 48-hours post-exercise. It is obvious that strength is a big component to a big lift like this. The focus this movement takes will help you to improve your overall muscular strength, grip and muscular endurance. If you’re looking to decrease your running time to get ready for a race or event, making deadlifts part of your program can help get you there. You may wonder how a move like this can help to improve your posture. Strengthening the many muscle groups involved in pulling weight from the floor requires a certain amount of mobility in your hamstrings and shoulders. The form used in a deadlift, when done right, after a proper warm-up, will incorporate the muscled discussed above, strengthening your shoulders, back, abdominals, gluteus muscles, giving you the ability to sit tall, walk tall and improved abdominal control. To get into a program that involves deadlifts, along with a variety of other well-programmed exercises to improve your strength, and make you feel energized, email me at: thepurposefitness@gmail.com.